The first hint for a high Quality PSU can be seen when taking a first look at it. There is a nice design and high quality case. Seasonic decided to go for a Sanyo Denki San Ace Fan, which is a very high end fan and unfortunately it can't be found too often in todays power supplies. Right at the Input there is an extensive filtering stage, which has been place on a separate PCB. At the PCB the transient filtering stage continues with one X cap, four Y caps, a CM and a DM choke as well as a MOV (Metal-Oxid-Varistor). Additionally there is a NTC thermistor for inrush curent limitation. A mechanical relais shorts the NTC Thermistor for normal operation. The transient filtering stage is well done. We have not seen many PSUs with such an extensive input filtering stage. In the case of the PFC Booster Seasonic makes use of a Schottky diode and the APFC itself is being controlled through a chip from On Semiconductor. 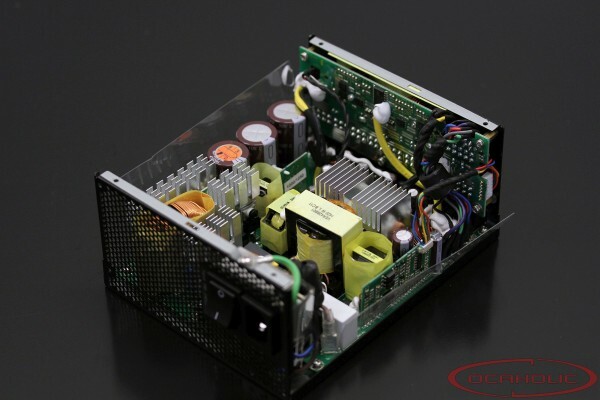 Apart from that this power supply features three APFC capacitors, which all come from Nippon Chemi-Con (KMR Series; 330uF, 420V, 105°C) and are therefore of very high quality. Four Infineon 5R250P mosfets (550V, 0.25Ohm, 27 A) are used on the primary side of the LLC resonance concerter and it is being controlled via a CM6901. The primary side of this PSU is rock solid. Especially the costly transient filtering stage and the high end japanese Nippon Chemi-Con Capacitors are excellent. A quick look a the secondary side show a rather big cooler, which appears to be not connected to any chips or mosfets. 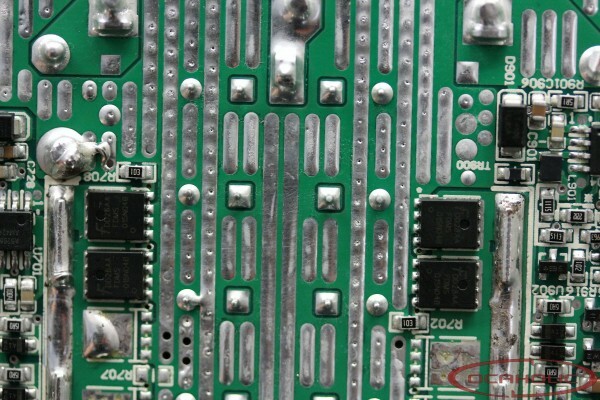 As soon as we turn the powersupply around we find four FMCS015N90B mosfets, that are connected to this heatsink. Also on the secondary side Seasonic is only using Nippon Chemi-Con capacitors in order to keep quality on a very high level. Checking for voltage regulation modules, we find those on a daughter PCB and in fact there are Infineon BSC0906NS mosfets in place, which are being controlled by an APW7159 PWM controller.